I am very thankful. I could not have earned this honor without your assistance. the 2015 Alumni Banquet on my behalf, I extend thanks and appreciation. The IBHOF Award is the greatest I have achieved…and again…it all began here in Thorntown, IN. 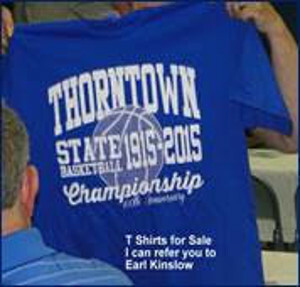 It was truly a team effort for the 300+ who attended the Thorntown Alumni Association Banquet on May 9, 2015, with the theme being to celebrate the 100th Anniversary of Thorntown’s 1915 IHSAA State Boys Basketball Championship Team! A huge thank you goes to EVERYONE who contributed in any way to the fun-filled day. It began on Friday, May 8th with lunch and visiting at the Lost Frontier and the designated Class of ‘65 judges voting on ‘Decorate Main Street’ winners, followed by set-up at Thorntown Elementary School with the help of some great TES students and THS alumni and friends. Decorations were put in place, positioning attendees seating line-up at tables by class year, and hanging unique posters on the stage for Fred’s Corner Café. Larry Campbell’s Tournament Central was set up, last minute skit practice took place, and visiting with friends was enjoyed as work was being completed for Saturday’s banquet. 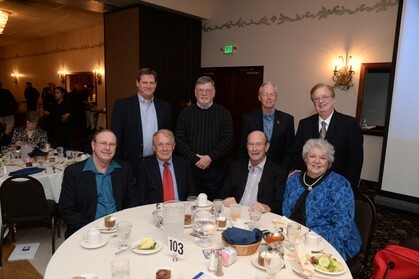 Later that day the Class of ’65 also held their Class Reunion Dinner at Stookey’s Friday evening with 22 classmates in attendance along with their spouse/guest. The Program opened with “Hello! We are glad you have come to visit us.” Translation to the Language of the Miami Nation is: Aya Aya! Teepahki Iishiteehiaanki Keewiihkawilotawiaanki. All attendees also sang OUR BOYS WILL SHINE led by pianist Grace Hamill Long and song leader Jane Gant Neff. Special Presentations were given (Martha Randel presented the Indiana Basketball Hall of Fame plaque honoring Thorntown’s 1915 Championship Team to the Thorntown Heritage Museum, accepted by John Gillan, plus Earl Kinslow and Denny White gave a special plaque to Pam Taylor, TES Principal, honoring Thorntown’s 100th Anniversary Championship Team.) A short Alumni Business Meeting and election of 2016 Alumni Officers were conducted. Bringing the program to a close…Grace and Janet with help from ALL sang OUR BOYS DID SHINE followed by our THS Loyalty Song. I do personally want to THANK YOU ALL from the depth of my heart for all you did for the 2015 Thorntown Alumni Banquet. It truly was a TEAM EFFORT and a WIN FOR ALL!! Go Keewasakees! 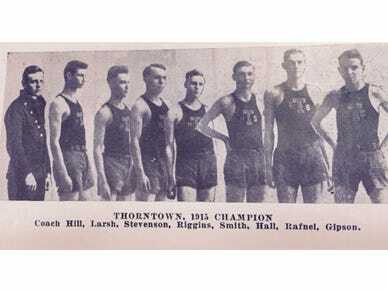 The 1915 Thorntown High School boys basketball team was the Indiana state champion. THORNTOWN — Why would a community go out of its way to honor a high school basketball state championship team from 100 years ago? Thorntown, a community of 1,500 in Boone County, hasn’t had its own high school since the last senior class graduated in 1974. But back in the early portion of the 20th century, Thorntown was part of the “Cradle of Indiana Basketball.” The first eight high school state champions came from a 30-mile radius — Crawfordsville in 1911, Lebanon in 1912, ’17 and ’18, Wingate in 1913 and ’14, Thorntown in 1915 and Lafayette Jeff in 1916. 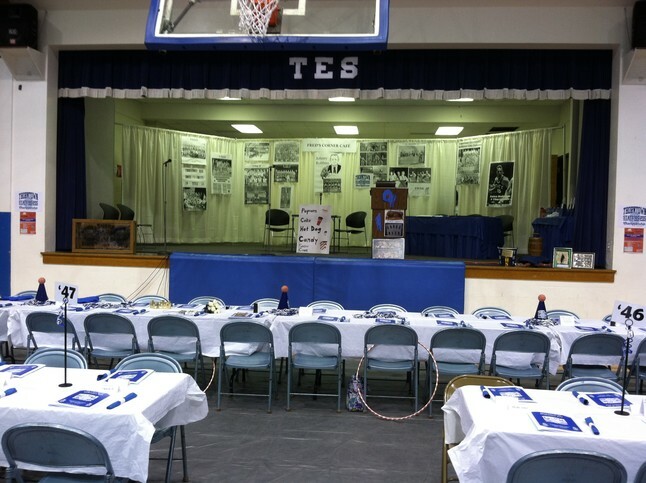 On Saturday at the Thorntown Elementary School, the alumni association will celebrate the accomplishments of the 1915 team at its annual banquet. It’s been a long time coming, according to many of the alums, who hope to eventually raise money to put signs outside of town to honor the championship. There are also plans for the downtown merchants in Thorntown to dress up their businesses in the blue and white of the school’s colors this weekend, as well as invite graduates of the rival schools near Thorntown. There will be displays available for viewing beginning at 9 a.m. and a buffet lunch served at noon. 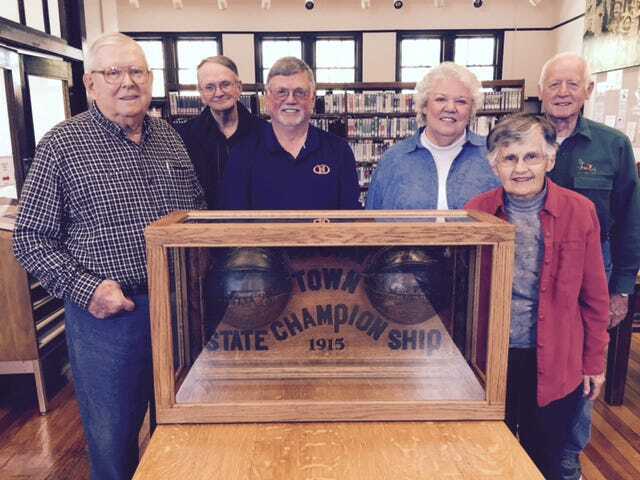 Cliff Woody (from left), Gordon Wait, David White, Martha Randel, Florence Emma Peery and Cliff Beesley surround the trophy for the 1915 Indiana state basketball champions of Thorntown High School at the town’s Public Library, 124 N. Market St.
As with many schools at the time, Thorntown in 1914-15 did not have its own gym. Previous Thorntown teams had played games in the opera house downtown, but local historian David White and others believe Thorntown played most of its home games in 1914-15 on the third floor of the grade school, in a large room that was also used as a science lab. The 1915 postseason was the first with a sectional round. 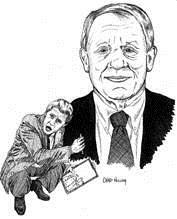 Thorntown, coached by a young Chet Hill (who would later go on to Martinsville, Lebanon and Kokomo and was inducted into the Indiana Basketball Hall of Fame), won the sectional at Lebanon by avenging a regular-season loss to the host and knocking off Rossville in the championship. Thorntown was one of 14 teams to advance to the state tournament in Bloomington. Thorntown won 46-20 over Hartford City and avenged a 14-point loss to Rochester, winning 17-14. In the final four, Thorntown defeated Manual 30-16 and blew out Montmorenci 33-10 in the championship. Al Smith, a senior, was the star of the seven-player team. Thorntown, later nicknamed the “Kewaskees” in the late 1920s, went back to the final four in 1919 — played that season at Purdue — and lost to Bloomington in a semifinal. Thorntown star Walter Cross, named the Gimbel (Trester) Award winner in 1919, was the grandfather of former Park Tudor coach and current UCLA assistant Ed Schilling. Thorntown never again reached such great heights in basketball, though the teams were successful and the passion ran high. Thorntown won sectionals in 1944, 1957 and 1960. Part of the legacy of the 1915 team was that it became immediately apparent that the community needed a larger gym than a third-floor science lab could offer. The following season, a gym was built in the space between the elementary and high school buildings (all of which are now gone). Thorntown built a new, modern gym in 1954. For the gym’s dedication, Milan — fresh off its famous state championship win that spring — made a visit for a game. But by 1974, Thorntown had gone the way of many small towns and lost its school to consolidation, in its case into Western Boone. Even after 40 years without a graduating class, Thorntown is still proud of his basketball heritage. Larry Campbell, a 1958 graduate and former player, was a part of a float in 2010 that honored 100 years of high school basketball in Indiana. With him that day was the trophy created in 1915 by coach Hill, which featured half of the basketball from the sectional title and half of the basketball from the state championship game. To Campbell and other Thorntown graduates, the 1915 championship is worth celebrating — even 100 years later. 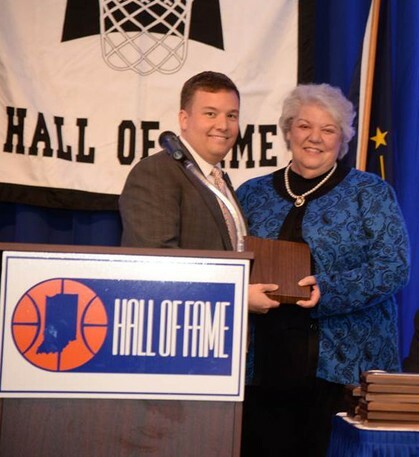 “It exemplifies the best of Indiana high school basketball,” he said. Attending March 25, 2015 IBHOF Men’s Awards Banquet at Primo’s. Martha (Maiden) Randel accepts the plaque on behalf of Thorntown from Chris May, Executive Director of IBHOF. Time is growing very short! Do not forget to order your tee shirt (pictured below)! The Alumni Banquet Invitation / Registration Form and Tee Shirt Order Information will be posted on this web site on February 1st. When the form is available, please consider printing out a copy and mailing it in according to the instructions. This will help keep mailing costs down as the Association will be mailing or emailing an invitation / registration form to each classmate on March 1st who has not yet registered. Hi! We are Linda Hayden Prage, Shirley Bunch Isenhower and Martha Maiden Randel from the Class of 1965! Many years have gone by since we stood as young men and woman in this building, becoming immersed in the spirit of the Keewasakee. Names like John Robbins, “Mick” Lamb, Sam Ramsey, Tom “horse” Maiden, “Red” Eaton, Jim and Bob Russell, David Williams, Gerald Coffman, Jim McBane, Danny Gatewood, Whitey Merrill, Gary Branigan, Bob Goldsberry, Ken Morrow, John Randle and Gary Lanpher are but a few that come to mind as we think back on the glory days of this high school and its storied history of basketball triumphs. As we approach the 50th anniversary of our graduation, we remember an even more historic event – the 100th Anniversary of the 1915 Thorntown State Basketball Championship brought home to our small town by team members with names like Alford “Alf” Smith, Andy Riggins, Orv Hall, and ‘High’ Larsh coached by Chester Hill, listed as the best coach in the State of Indiana that year. What an achievement for our community! We still talk of the team and its members when we get together to remember times gone by. As members of the class of 1965, it is our honor and privilege to invite you to join us for the 2015 Alumni Banquet, as we pay tribute to that famed team and remember all athletes in all sports, coaches, ADs, team managers, Girls Athletic Association (GAA) members, cheerleaders and mascots who helped to provide moments of high drama and intense excitement at Thorntown High School. If you participated in any athletic endeavor at Thorntown or were part of the support staff that made these events happen, we salute you and hope you will attend the 2015 Alumni Banquet as we focus on the “team spirit” that has always existed at our beloved Thorntown School. The 2015 Thorntown Alumni Banquet will be held on Saturday, May 9, 2015. Doors open at 9 a.m. allowing time for your sports-related memorabilia to be set up. Our annual group photo taken at 11:15 a.m. Lunch will be served at NOON followed by our Alumni Meeting and Program. Anyone who ever attended Thorntown Schools during their school career is welcome to attend the banquet. We look forward to seeing you there.